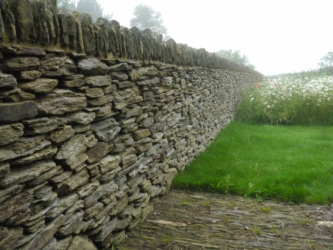 Rural Stonework and Landscapes Ltd have been building stone walls across Devon for the past 20 years. We believe in using traditional materials whenever possible, and building walls that last. Much of our stone walling is built dry-stone, using local materials when available and in keeping with local styles. When building mortared walls, we prefer to use lime mortar, rather than cement, for both the longevity of the stone, as well as for aesthetic reasons. We are also able to build walls that are dry-stone-looking. Examples of our fine Devon Garden Landscapes can be found in our gallery.